Look to Madrax when you want bike racks that are functional, stylish, and durable. For more than 25 years, we have set the standard for high-quality bicycle storage and parking with our handcrafted products that are attractive and easy to maintain, year after year. 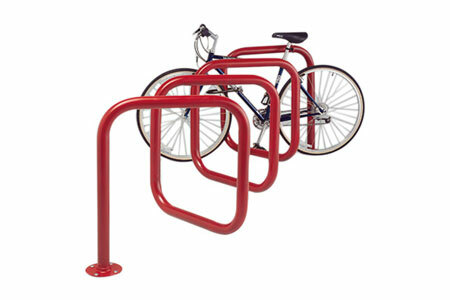 Browse our wide selection of bike racks and storage solutions below, and contact a Madrax bicycle rack expert at 800-448-7931 or at sales@madrax.com if you have any questions or concerns. The Genesis bicycle rack transcends form and function to make a bold, aesthetic statement. When empty, the simple “floating” concentric rings of the Genesis™ look like an attractive outdoor sculpture. When full, these same concentric rings park bikes safely and securely. The Genesis™ offers two contact points, at front and rear, for locking. The unique concentric design of the Genesis™ helps guide bikes into proper parking position while providing double the parking space of typical serpentine racks. The Genesis™ features heavy-duty 2-3/8" OD structural steel tubing (2" Schedule 40 Pipe). It is available in configurations that park up to eight bicycles. The Genesis™ is available in a galvanized finish, a wide range of powder coat colors, and a stainless steel finish. Style – Its unique concentric design makes the Genesis™ the ideal bicycle rack for buildings. Security – Heavy-duty construction and concentric design are ideal for use with U-type locks.